Located only a short drive from RTP (Research Triangle Park) and RDU International, this residential community consists of single family homes, townhouses, and condominiums. 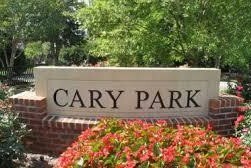 With housing to fit families of any size, Cary Park offers its residents not only a home, but a community. Located close to plenty of shopping, several paved paths perfect for a nice stroll or a bike ride, and beautiful Cary Park Lake, you'll never run out of things to do or beautiful sights to see.